It's often said that Aboriginal people in this country are politicised from birth. Indeed, considering the many policies governments have enacted to control our births and then forcibly assimilate us when we do arrive in the world (think the Stolen Generations, the NT wardship system, the continual fight we have to prove that terra nullius was a massive lie), our births themselves end up being somewhat of a defiant political statement. And due to the continuing injustices, it's generally not too long before Aboriginal kids end up out on the streets, protesting alongside their family members. For a lot of us, this education is almost as basic as learning to talk and walk. I have a photo I am exceptionally proud of. I had dragged my then four year old nephew along to a Black Lives Matter rally in the Melbourne CBD. Not only did the nephew join in the chants and march the entire way on his little legs without complaining once, but he stood in front of a group of Aboriginal people holding up our flag; his fist clenched and raised to the air, looking incredibly defiant. It was his first rally, and he handled it like a seasoned advocate. Little did I know that taking him to a rally could be seen as a form of child abuse. When news started coming through social media channels over the weekend that the Queensland police had not only bullied and orchestrated arrests of Indigenous protesters at Camp Freedom Commonwealth Games protest, but that child protection officers had been sent in, apparently on the directive of the QLD government; it chilled me to the core. Wasn't it enough that they had been heavy-handed in their arrests? That Don Dale survivor Dylan Voller was harmed in the back of a police car following his second arrest? That throughout the Games, the media mainly chose to demonise Camp Freedom and its activities? Perhaps the protests were gaining too much attention, because at some point it was decided to frame them as child abuse which required intervention. "It's almost a cycle of retribution: Indigenous activists gain some traction and the government or the media come in low to discredit this gain." It seems that rather than even remotely looking to ensure Aboriginal children are safe and taken care of, governments would rather use them in some twisted game designed to discredit Indigenous rights movements and/or our autonomy. Certainly, when you considering Mal Brough's crocodile tears after years of Howard government neglect as they rolled in the Northern Territory Intervention as their swan song, or Julia Gillard's sudden interest in this matter when it became politically poignant for her to talk about the 'rivers of grog' allegedly flowing through NT communities, the governments have some form. It was additionally interesting that this move came mere days after protests successfully disrupted a live beach broadcast of channel 7's Sunrise. The Indigenous issue with Sunrise started when the show decided to have an all-white panel essentially advocating for another Stolen Generation. This was exacerbated when Sunrise used a fake backdrop to silence Indigenous protesters who had gathered to call out their earlier racism. On the Gold Coast, there was nowhere for Sunrise to hide. While Samantha Armytage and David Koch fumbled through their broadcast, the passionate crowd drowned them out. It's almost a cycle of retribution: Indigenous activists gain some traction and the government or the media come in low to discredit this gain. Whether it's a highly peaceful and successful Invasion Day march being reported as violent while demonising a single activist for a staunch line, or the news cycle we've seen around Camp Freedom and the insinuation made by the authorities that children welfare is a concern, it never seems to end. Yet the realities get lost. This was a protest camp which had paid money to be there and which had negotiated with authorities for months. The camp was a peaceful, yet staunch, place designed for the community. 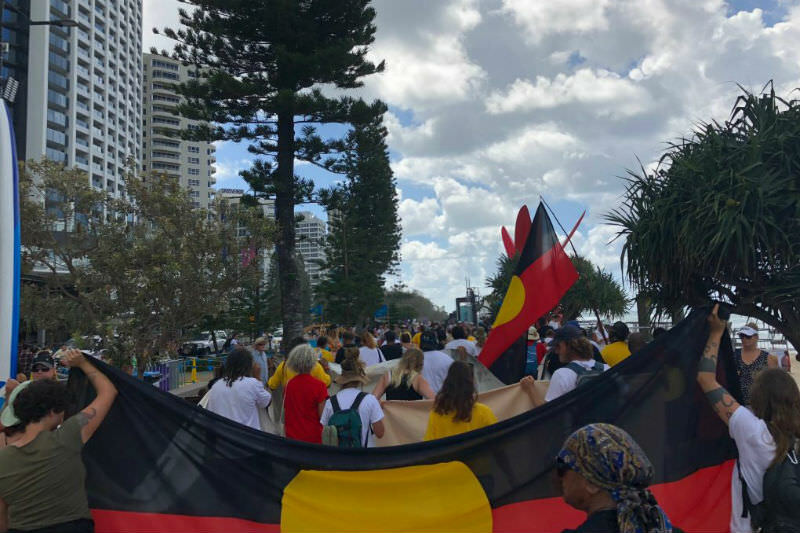 Camp Freedom is the latest in a long proud history of protest which has occurred at Commonwealth Games Australia has hosted. Making a stand against the celebration of the colonial powers, as First Peoples, will remain important as long as the injustice continues. If the powers that be are not keen on protests happening while Australia is on the international stage, the answer is simple: stop demonising Indigenous people and using our children as cannon fodder and start listening and acting. Ignoring the message in the hope it will eventually just die out hasn't worked for 230 years. Protective stances don't hold true when kids are still being removed and incarcerated at exorbitant rates while engagement programs are continually cut. You're not listening if you're continually showcasing us on your terms while dismissing our political voice, denying our presence and erasing our history. Create a society where protest is no longer needed because there is knowledge, collaboration and a commitment to a better future. That would be a closing ceremony deserving of accolades. Celeste Liddle is an Arrernte woman living in Melbourne, the National Indigenous Organiser of the NTEU, and a freelance opinion writer and social commentator. She blogs at Rantings of an Aboriginal Feminist. Recent articles by Celeste Liddle. Yes. Beautifully written, have shared. What a great article, what an important voice coming out of Camp Freedom. You are fighting for the soul of our country. Thank you Celeste. Your comments are timely & appropriate. Another commentary from Richard Flanagan at the National Press Club adds a clarion call to yours for the country to wake up. Thanks for this shrewd and passionate piece, Celeste. I think we may share a forebear with the surname Earwaker. I have met Bob Liddle in Melbourne (?your father). Love your work. Great article. Thank you. My son has been marching along side me since he was old enough to walk. before that, he rode on my shoulders. Your piece Celeste and Richard Flannagan's address to the Press Club make me sad, angry and hopeful. If you and Flanagan and people like you keep quiet and if there is no Camp freedom we will be dragged backwards. Thank you so much. Hello I was at Camp Freedom when this happened, it was a show of force akin to the military, which I believe 'Radical Title' means. It was uncalled for and unnecessary because we had permits and it was the holiday period for people to enjoy and interact with each other peacefully. Thank you Celeste. We so badly need this other side of the story. Reading your article some days later. What more will 'they' think of - sending child protection people to such an event. One night during the Commonwealth Games I had looked on the internet at the commemoration documentary of the anniversary of Martin Luther King's assassination with the peaceful marches, protests and police violence Then turned on the TV news to immediately, see 60 years later, police in Queensland Australia violently treating Aboriginal peaceful protestors. But no amazed or shamed reactions from the commentators here. How comfortable does anyone really need to be? The amounts of money that get quoted in remuneration packages or property portfolios is incomprehensible to many Australians who manage to survive, even thrive, on so much less. Inequality seems to be driven by an incapacity to recognise what is enough and to stop. The #MeToo movement, exposing harassment and abuse through personal stories, was no surprise to me. I couldn't be less surprised at the scale and depth of subjugation women still experience. But we must also recognise that women's disadvantage is a continuum where sexism meets ageism.